Is this low mileage Defender 90 your next car? Matching numbers and in great condition! 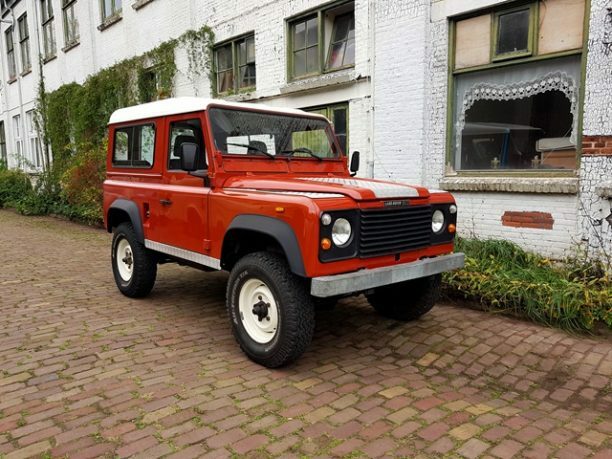 You’re looking at an original 1987 factory left hand drive Land Rover Defender 90 2.5 TD with only 18.500 documented original miles on the clock. One careful owner owned this low mileage Defender and always maintained this car to the best of their knowledge. Somewhere in its life both front fenders and both rear side fenders have been repainted (probably due to scratches as I have not found any proof of damage). All other Terracotta Red (red/orange/brown) is the factory original color. This is only the second Defender I have seen in this cool color. The car drives like new. No strange noises or rattles: it just drives how this car is supposed to drive! You can own this low mileage Defender which is in more than great condition. The Defender 90 is absolutely rust-free and we treated the chassis with tectyle to prevent it from any damage. The pictures speak for themselves, you’re buying a beautiful low mileage Defender! If you have any questions, please do not hesitate and contact me by email or send me your phone number so I can contact you.